Photo of Brad Ranola by T Christian Gapen. It’s been a banner year for Midtown Ventura’s Anacapa Ukulele. In February, Brad Ranola and his partners opened a second ukulele shop, in Los Angeles. In June they hosted the first L.A. Ukulele Expo, and now they are looking to expand the Ventura shop they first opened as a leap of faith three years ago. The countless YouTube views of ukulele virtuoso Jake Shimabukuro shredding the cover of Queen’s “Bohemian Rhapsody” could be a big reason for their success. And who can forget Israel Kamakawiwo’ole’s timeless but fairly recent “Somewhere over the Rainbow”? Ukulele music has come a long way since Don Ho’s “Tiny Bubbles.” The modern ukulele movement has indeed piqued the interest of a new generation of would-be players. But Ranola insists the instrument’s broad appeal is due to its size and ease of use. “Four strings, four fingers is a lot easier than six strings, four fingers; and the nylon strings are easier on your hands,” Ranola says. A professional international musician for the last 18 years, Ranola got bit by the ukulele bug five years ago, but in order to get ahold of the instrument he wanted, he had to call a friend in Hawaii. He soon realized this was a niche that needed to be filled. With a mid-century vintage Hawaiian vibe, the Ventura shop’s design is meant to encourage hands-on interactivity with the instruments they have for sale. It’s this play-before-you-pay philosophy that draws customers in. Among the more unique ukuleles they sell are the bongolele, the banjolele, and a surfy ‘50s-era ukulele with an enormous headstock—to stick in the sand like a surfboard. They’ve also got an iconic triangle-shaped treholipee, “a fun kitschy instrument” that Ranola says would be perfect at a place like VenTiki Lounge. While co-teaching a ukulele class at Disney Concert Hall with Grammy Award-winning Hawaiian musician Daniel Ho, Ranola shared what he and his partner Cary Hitsman had done at Anacapa Ukulele. Ho suggested a partnership with himself, blues ukulele master Jason Arimoto, and the Japanese American Cultural Community Center in Los Angeles. 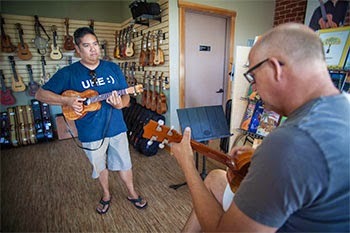 Within a year, U-Space opened their ukulele retail shop, ukulele school, and café in the heart of L.A.’s Little Tokyo. In addition, the partners dedicate a lot of their time to non-profit outreach, providing instruments and instruction to underprivileged youth in the community. Growing in popularity is the kanikapila—a sort of ukulele circle/jam session. Anacapa’s website lists several locations throughout Ventura County offering weekly gatherings. Ranola sees the company expanding in Ventura in much the same way U-Space did in Los Angeles. He’s hoping to soon add a café featuring local pour-over coffee and prepared sandwiches and pastries. “Coffee and ukulele go hand-in-hand,” Ranola says with a hopeful smile. He could be on to something. The world could certainly use more coffee klatches and impromptu kanikapilas. Photo of Dr. Shocker by T Christian Gapen. Despite its downtown location, you’re sure to feel like a castaway at VenTiki Lounge & Lanai. With its piped-in ukulele music and occasional orchestrated volcanic eruption, you can almost hear ripe coconuts falling to the ground. Cocktails are taken seriously here—you won’t find a drop of pineapple juice in the Mai Tai, which is made the proper way, right down to the hand-smacked mint leaves called for in the original recipe created by Trader Vic’s in Oakland in the 1930s. “In the tiki community, we believe in traditional garnishes to accentuate the drink,” says Dr. Shocker, VenTiki’s manager and self-proclaimed evangelist preaching the gospel of tiki. Since opening 15 months ago, the quirky little bar has become a popular locals’ hangout, and a regular stop for Ventura Food Tours. 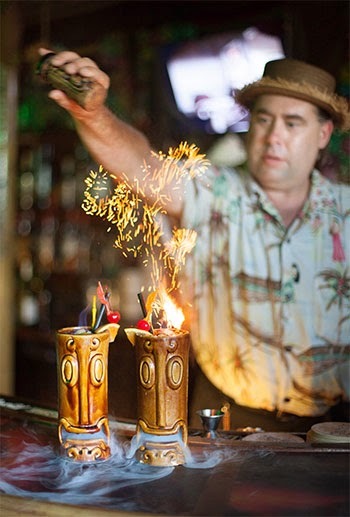 Drinks made with myriad ingredients are served in intricate tiki mugs and sometimes set ablaze. “The Alter of Sacrifice—it just screams it needs fire.” Made with lime vodka, two kinds of bitters, and spiced vanilla syrup, it certainly does. Dr. Shocker brings another Zombie to life. With Halloween approaching, a favorite seasonal cocktail is the Zombie, which was invented in the ‘30s by Don the Beachcomber. Combine all ingredients in a shaker and pour into glass. Garnish with mint and lime.